5 Beds 2 / 1 Baths 2,581 Sq. ft. Description: (Walnut creek) woodlands finest! 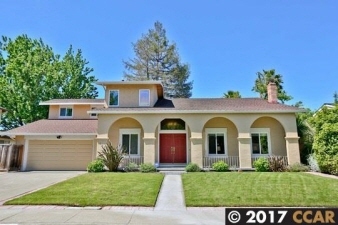 This home has it all 5 bedroom 2 1/2 bath, fantastic curb appeal, 3 car driveway. Double door entry. Fifth bedroom, downstairs, great for an office. Formal living room with cathedral ceilings, granite faced fireplace. Adjacent to living room is a large formal dining room. Very pretty large stainless steel and granite eat-in kitchen with center island great for entertaining. Terrific family room with vaulted ceiling and beautiful brick fireplace and sliding doors to the backyard and patio. Very spacious inside laundry room. Flooring downstairs consists of brilliant hardwood, stone style tile and lush carpet. Upstairs there is a fabulous master bedroom suite and fabulous remodeled master bathroom with shower and soaking tub. There are three more great bedrooms and another gorgeous remodeled full guest bathroom. This home features dual zone heating and air conditioning, dual pane windows, and sliding doors leading out to a spacious lush backyard.